I get lots of questions from all over the world about Edmodo. I am happy to receive and answer as many as I can. Most simply want some clarification on certain features while others are asking if something can be done at all. Last week was a little different. It was from a student who was unsure what their teacher was asking pertaining to an assignment. I like all the questions I get but this one was particularly interesting because it is a question I get from time to time at my own school. Have peaked your interest yet? I hope so. Read on past the break to see what it was. Hello i have a question about edmodo. My teacher just wants me to reply a paragraph on a book review directly through his post to him only. If i hit reply it will just go into a thred beneath and that isnt what he wanted. Please help me. So basically the teacher posted a paragraph about a book review and wants students to reply to him, but he wants to be the only one to see the replies. The student in this case believes (and is correct here) that what the teacher is asking for is not possible. However, this is a way that it can be done by making an assignment. Check out the more detailed explanation of what I think the teacher should have done. This is pretty easy and a question I get from time to time. A teacher wants students to respond or write a short essay in response to something that is posted or is going on in the world. The first thing you need to do is make the assignment and attach the article, website, or question. The students will click Turn In. 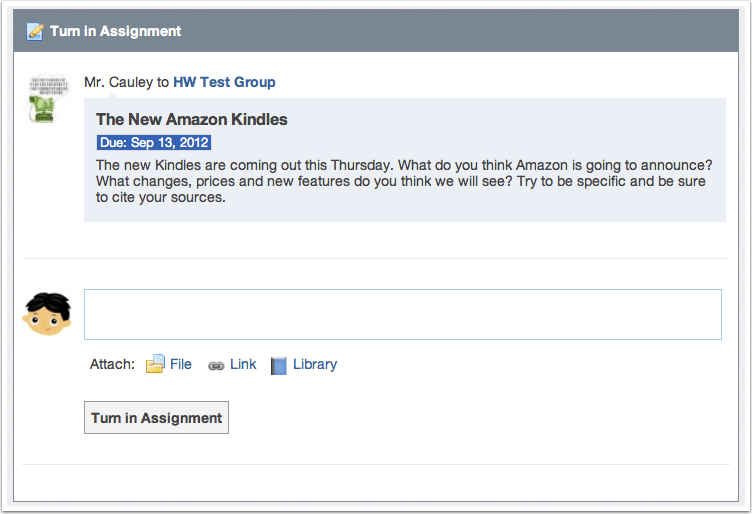 The student will either write their answer right in the comment box or attach their document file to the assignment. Now the teacher will only see the results and can give the students a grade (even if it is just a pass/fail grade). This entry was posted in Edmodo, Patrick Cauley, tutorial and tagged assignment, student response. Bookmark the permalink.